We deal with a number of different cooking oil companies and we can assist you with different cooking oil brands and options. Please find below list of some of the cooking oil that we can assist you with such as sunflower, palm, soya, maize, canola, blends and more. We have cooking oil in different sizes and packaging and can also assist with bulk cooking oil supply. 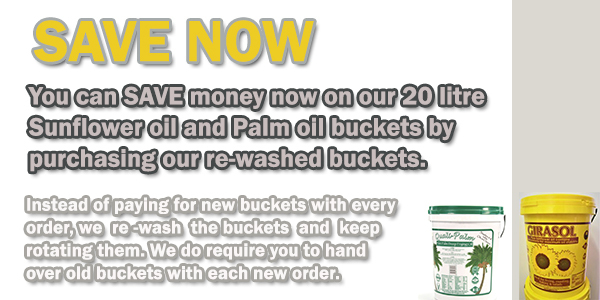 We also deal with certified used cooking oil companies and can help this this too. We supply brands such as Girasol, Qualipalm, Flamenco, Crispa, Excella, Ballons and more. If you would like to purchase please drop us an email, send us an enquiry through the website or give us a call. We deliver to most regions within Gauteng and Pretoria as well as surrounds but please contact us to find out if we can deliver to your area and which days we deliver to you.